The U.S. Conference of Catholic Bishops on Thursday rejected the Obama administration’s revised mandates on contraception. Washington (CNN) – The U.S. Conference of Catholic Bishops does not support the Obama administration’s revised proposal for providing insurance coverage for contraception, saying it falls short of addressing concerns about religious freedom. Although the bishops identified the changes as a step in the right direction, they made it clear that they were not satisfied. The proposed guidelines would allow religious-affiliated organizations opposing contraception to opt out of a federal mandate requiring that they provide their employees with insurance coverage for birth control. The policy would give women at non-profit, religious-based organizations, like certain hospitals and universities, the ability to receive contraception through separate health policies at no charge. Following an uproar among religious institutions that didn't want to pay for contraceptives, the administration in March offered several compromise alternatives. The plan unveiled on Friday was a result of that effort. The proposed update continued the administration's attempts to resolve the contentious issue of how non-profit organizations can decline to provide contraception coverage to their employees on religious grounds without facing a penalty. An original mandate on providing contraception was part of the new federal healthcare law spearheaded by Obama, the Affordable Care Act. It required that insurers provide, at no cost to those insured, all forms of contraception approved by the Food and Drug Administration. A number of high profile lawsuits have been filed against the federal government on the issue, including from the craft store giant Hobby Lobby. A group of 43 Catholic organizations challenged the rules in federal court in May. As part of the new initiative, groups that are insured - such as student health plans at religious colleges - would be required to let their insurer know that certain participants would like contraception coverage. “The insurer would then notify enrollees that it is providing them with no-cost contraceptive coverage through separate individual health insurance policies,” the HHS statement on the policy said. Although the agency has not estimated final costs of the plan, it said that offering free coverage would actually lower expenses over the long term, partly due to improvement in women's health and fewer childbirths. Because the insurer would be covering the costs, the administration hoped the changes would allow religious organizations morally opposed to contraception to avoid paying for it. The updated rules proposal will be open for public comment through April 8. The administration would then decide whether to make it final. The Catholic Bishops indicated in their statement that they look forward to working with the administration on the final policy. “We welcome and will take seriously the administration’s invitation to submit our concerns through formal comments, and we will do so in the hope that an acceptable solution can be found that respects the consciences of all,” Dolan said. Next entry »What happened to God in America? I object to my tax dollars being used to pay for murdering of innocent and defenseless babies. Obama and co would like to focus attention on the banning of assault weapons. Fine with me but if we are going to talk about protecting innocent children from murder, then lets include eliminating state sponsored abortions. Far more children are killed every day this way than through insane kids with guns roaming the halls of schools. We don't want either kind of child murder. Why is one OK when we label it freedom of choice? Murder is murder, you can't change that by applying a pleasant sounding label. "Murder is murder, you can't change that by applying a pleasant sounding label." Fortunately, in the U.S. secular law and our courts determine what is murder, not your impotent immoral god or your fictional bible. readers: please replace "too" and "their" with my erroneous "to" and "there". "The Catholic Bishops indicated in their statement that they look forward to working with the administration on the final policy." Excuse me?! Why? They want tax exemption (that excludes them from taking political stances) AND they want to dictate to the government how to legislate? These silly men have waaay to much relevance in the world. Make them all garbage collectors. I'd love to see them still dressed in their cute "look at me- I'm special" magic suits while there hangin' on to the backs of garbage trucks and tossing crap into the truck. You should keep in mind that your lack of tolerance for anyone else's beliefs about anything makes their lack of tolerance for you acceptable. Do you really want a government that doesn't respect the personal beliefs of the individuals it serves? You are able to be obnoxious because in fact, the government is required to tolerate and in fact protect the freedoms of the individuals it serves. We are free because we are all free, not just because you're free. The Papal doctrine on contraception has no more right to religious toleration than the Papal doctrine of Galileo's time, that the Earth was the centre of all Creation. The inescapable fact is, that at the rate of human multiplication of the past 50 years, its world population will exceed 15,000 million by 2063. The Lord will provide for that, with disease and famine, unless the nations resort to atomic bombs for slaughtering each other. The doctrine against contraception is therefore IMMORAL. Man is the ultimate proprietor of procrastnation. To assume our best destiny is to stay on this rock is to doom humanity to extinction as it's only a matter of time until some mass extinction event takes care of the overpopulation issue. I for one believe our best hope of pushing out into the universe IS overpopulation. I think the scinetist in you might recognize the principle as diffusion. A sufficient concentration of humanity will be necessary to cause it to spread out enough to survive. You may think your species does not deserve to exist. I do. Anything to take the attention off of priests molesting little boys huh. Tell you what church, fix that problem and then we can talk about your issues. Until then shut up. Good for them. I object to the health insurance laws on the grounds of human rights to freedom and decisions making, but if it tramples of religious rights to then go get 'em Catholics! Pay attention! Stop letting the Catholic church think for you. The choices are provided by the affordable care act. If a person chooses not to use contraception, for what ever reason, he or she can choose not to do so. It is a choice...oh I see..people raised in the Catholic church are not familiar with choosing for themselves on most issues. That's what threw you, ugh? True spirituality comes from within...not from some man in a funny costume telling you how to live...have you ever heard of Jim Jones? It is all the same thing. Religions leach off the rest of us. That's hilariously random and idiotic. How do religions leach off of people? In America, religion is voluntary, and do you want to tax children since they 'leach off the rest of us"? Sorry, but it seems like you are being randomly anti-religion for, at least if I go by your professed reasons, stupid and untrue causes. Exactly, remember when GWB put up federal dollars to churches under his faith based initiative program ? Those were my tax payer dollars going to something I dont believe in. No one seemed to care when I complained so why should I care when they complain. When the churches start paying taxes, then they can complain about secular policy. Until then they should shut up. They have no right to force their religious beliefs on those who may not follow the same dogma. It is another example of the churches forcing discrimination upon those who don't subscribe to their teachings. Besides, if their religion is so strong, why do they worry. Don't they have confidence in their own members, and their own teachings? But the government has the right to force people to pay insurance on the government's terms? How is that fair? Let the religious folk pay church taxes and such, but let's also keep the government from trying to run everyone's lives. The opposition to birth control is not based upon any sort of moral or theological grounds, unless interfering with disease is also an interference with God's Will. But if it were, then the Catholic Chruch has no right to be running hospitals, and should sell them to the government. Albert Rogers...only true if you believe pregnancy to be a disease. This is unfortunately true of current medical standards. It is however a natural condition and a choice. YES, NO, MAYBE, I KNOW, MAYBE I DON'T KNOW!!? In the "name of the holy father"? Does this refer to God or the Pope? Confession? Father, I have commited sin and murder! Say 10 hail marys and you are forgiven? Soooo, you have the authority to SPEAK for God and disobey the commandments? You revel in your dress and adornments, kiss the hands of superiors? Worshipping "false gods"? You speak and teach that "our way" is the "word of God? YET, you change positions depending on the times? You have your OWN city, government, police, banks, which are "protected" from outsiders looking in! YOU have the power to, excommuniate, followers who do not "tow the line"! You have "priests" and others who have commited sin, and abused our children, and the results have been a 'COVER UP", pay offs and have ONLY taken action when there was no other choice! DO NOT get me wrong, ALL religions have their problems, but it seems obvious that the catholic church is embedded with them! Hey who told you guys in the third row you could take off your hats? all of you who agree that we can stop focusing on women's health issues and feed the poor, take off your hats. It's a conscience issue. Should someone be forced to pay for something they do not believe in? Should they be forced to cooperate in evil? Shouldn't the secular government pay for secular-minded health insurance policies? Why force religious people to violate their consciences just for the sake of a non-religious plan? Let the government insure this stuff. Order in the next 11 hours and get it by Monday, Feb 11. 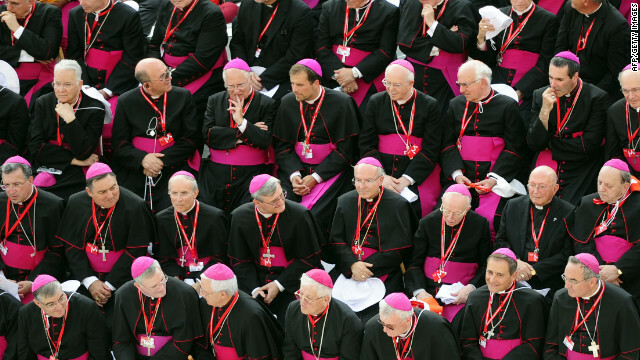 I can understand why the bishops' position against O'care: contraceptives will cause a shortage of young boys. SNAP = Survivors Network of those Abused by Priests. An organization that provides a road to recovery for both boys/men and girls/women of abuse. The problem is we live in an age where the federal government wants to be monolithic. Offering the freedom to opt out of mandatory insurance (or, god-forbid, choosing your own health insurance program) denies the government power they strongly want. This is statism at it's finest, and it's pathetic that people even question whether churches, citizens, corporations, or families have the right to make decisions for themselves and that the nation as whole voted that they do not and the government ought to decide for them. I am not satisfied with the cover up of the highest ranking Catholic in Los Angeles, with his own real estate in the church down town for his tomb, and the rest of the cover ups during the investigations of the children abused. Why are they getting a say in anything to do with Health? Did they stand united in defending the kids they abused? Religions leach off the rest of us. They take our tax dollar, government grants, and act as if they are doing good deeds. The use our roads, water systems, fire department, police department,.. Tax them as the businesses they really are and tax their property too. Each service they offer is a duplication of already existing services. And each of those services are poorly run. There are different opinions as to what a religion really is or what a non-profit is and therefore all non-profits should file Form 990's. At the moment, religious groups are exempt. To be fair therefore, there should be no tax-exemptions for any group and that includes the Democratic and Republican Parties. Faith and community initiative grant monies should also be cancelled and there should also be no tax deductions for contributions made to charities and non-profits. In order to pay down our $16 trillion debt, we need to redirect money used to support/control religions especially the christian and islamic cons and put it towards paying off our debt. Giving to religious groups dropped 1.7 percent from 2010, totaling $95.8 billion, the report found. Religion is the largest single category of recipients. I do not understand the Catholic Church stand against Birth Control included in an insurance policy. Insurance covers Breaking your Neck and I don't plan to use this part either. Catholics may choose to use these products anyway. They may always ask for forgiveness in Confession.